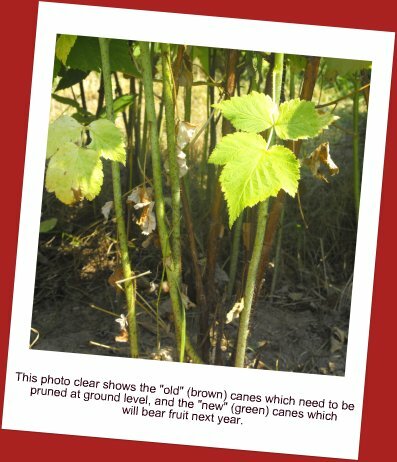 WHY is it Important to Prune Raspberry Plants / Bushes? It is important to prune Raspberry Plants from time to time. Firstly, pruning helps to thin the raspberry bushes so that the fruit inside the bushes can obtain enough light. Thirdly, pruning helps to control disease by increasing airflow. When pruning raspberries, the specific pruning procedures are based on the growth and fruiting characteristics of the different varieties and types of raspberry plants. In the spring when pruning raspberries, remove all the weak, diseased, and damaged canes at ground level. Leave the healthiest and strongest canes. Remaining canes should be spaced about 6 inches apart. Also, prune out the tips of the canes that have died due to winter injury. Cut these back to live growth. Maintain plants to a 1 to 2 foot wide hedgerow using a rototiller or a spade. As soon as fruiting is over, cut down to ground level the old canes which have borne fruit. Allow the healthiest and strongest of the young canes to remain standing to provide next year's fruit harvest. For proper maintenance of the raspberry plants, it is important to prune them using a sharp pair of pruning shears. It is important that the pruning shears be sharp to prevent damage to the plant. 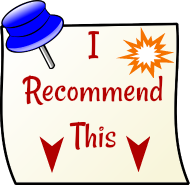 Scroll down for examples of quality pruning shears and HOLSTERS too!! Holsters allow you to use TWO hands when you need to! Allow about 5 young canes around each original plant. It will not be difficult to see which raspberry canes bore fruit, because those particular canes begin to look "woody" and yellowy/brown in colour (unlike the fresh green colour of the young shoots) after they are finished bearing fruit. This (above) is one of our rows of raspberry plants BEFORE the plants have been pruned. Note the "old" brown canes/stems still need to be pruned out. This (above) is one of our rows of raspberry plants AFTER the plants have been pruned. Note the "old" brown canes/stems have been removed. 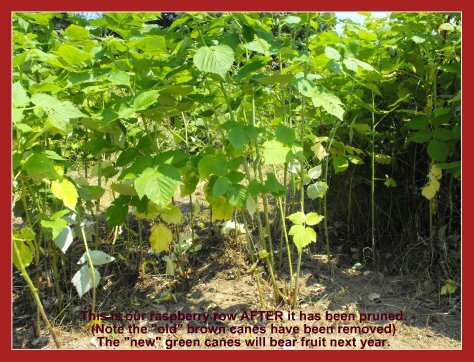 The "new" remaining green canes/stems will bear fruit next year! In the spring, remove all weak, diseased, and damaged canes, leaving only the most vigorous canes. Also prune out the tips of the canes. The summer crop will be produced on the side shoots of the remaining portions of the canes. Maintain the plants in a 1 to 2 foot wide hedgerow. After the summer crop has been harvested, prune out the old canes which bore fruit. (Using the one-crop system for growing fall-bearing berries, as compared to the two-crop system will produce a higher total crop yield.) In the spring, prune all the canes to ground level. This eliminates the summer crop, but the fall crop will mature one to two weeks earlier. Maintain the plants in a 1 to 2 foot wide hedgerow. No summer pruning is necessary. 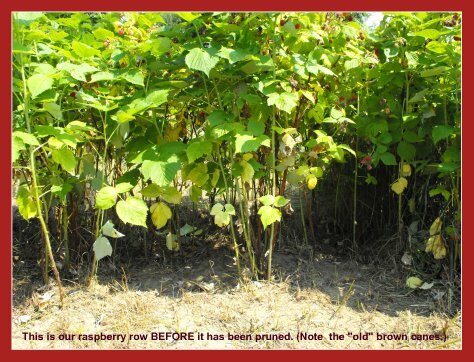 Since yellow varieties of raspberries are identical to red raspberries, except for their fruit colour, they are pruned the same way that you would prune their red counterparts (summer-bearing or fall-bearing). 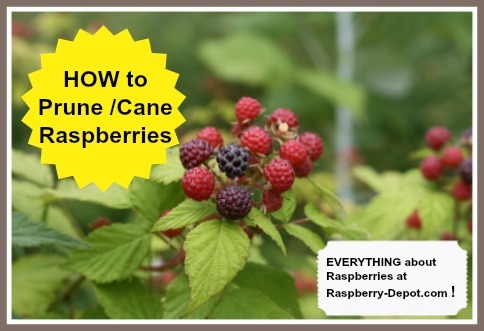 When pruning raspberries in the Spring, remove all of the small, weak canes, leaving about five of the largest, healthiest canes per clump or plant. 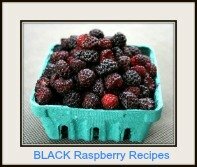 Cut back the side branches to 12 inches in length for black raspberries, and 18 inches for purple raspberries. Starting in late Spring/Early Summer (when the new growth reaches about 36 - 48 inches) cut off the shoot tips, removing about 3 - 4 inches of the tips. This helps side shoot development and nets a higher fruit yield. Since all the new shoots will not reach the desired height at the same time, go over the planting weekly till approximately late July. The canes that develop after July will lack hardiness, and can be pruned out the following spring. After Raspberry Pruning, destroy all cut-out canes. Destroy all cut-out canes immediately. If it is possible to burn them do so, otherwise dispose of them by eliminating them from the area where the raspberries grow. This prevents serious disease build-up since the sources of infection has been removed. What garden tool do you use to prune raspberry plants? For proper maintenance of the raspberry plants, it is important to prune them using a sharp pair of pruning shears. It is important that the pruning shears be sharp to prevent damage to the plant. It is advisable to wear thick gloves when pruning, to protect your hands from the thorns. Here (below) are some examples of suitable pruning shears for pruning raspberries which can be purchased online at *Amazon.com. The available "holster" for your pruning shears, is a VERY handy accessory to have, because you often need two hands to do a job, and you will not know where to safeguard your shears when you do so! 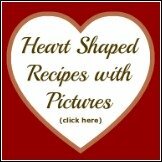 A Great Gift idea for the gardener on your "to buy for" list too! 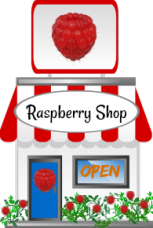 For additional raspberry growing information, please refer to the following helpful pages, or use the navigation bars at this website.